Mini Muscles for Ages 4 through 6! 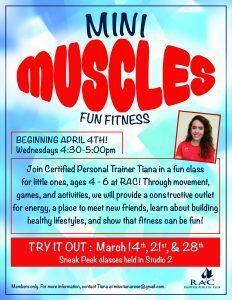 Raintree Athletic Club is excited to offer Mini Muscles beginning this April! This class is for children ages 4-6. Through movement, games and activities, we will provide a constructive outlet for energy, a place to meet new friends, learn about building healthy lifestyles, and show that fitness can be fun! Free to children of RAC members. Sneak Peek Classes: March 14th, 21st & 28th.